Seth Kirschner '18 in Deloitte's offices in New York City. 'Having input from my professors, especially those whose careers are full of industry experiences, definitely helped me in making a final decision' on an offer, he says. 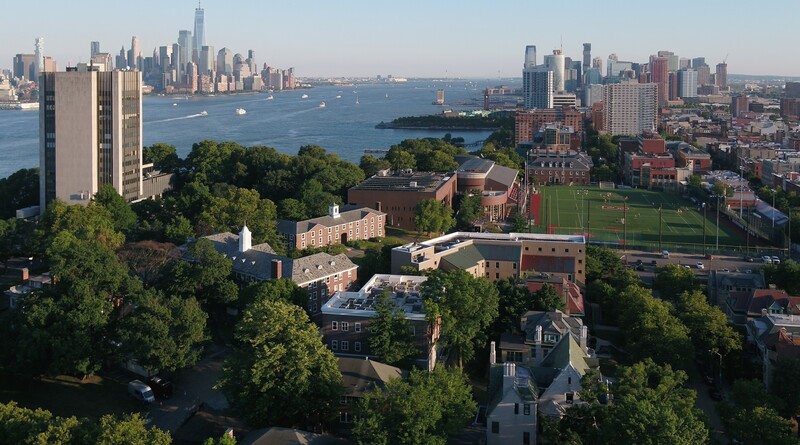 When most people talk about the Business & Technology major at Stevens Institute of Technology, they have a lot to say about the technology side of the coursework, which can include data mining, app design and social network analysis. Seth Kirschner appreciates all that — especially when learning how to apply technology to real industry problems — but said the business half of the major is every bit as important. Seth Kirschner, with microphone, presents during a meeting at Deloitte. He credited his Stevens professors with giving him the skills needed to stand out during his internship. At Deloitte Advisory, Kirschner worked in cyber risk within its Vigilant unit, a startup the company acquired. His two main areas of focus were business development, including evaluating how Deloitte sells services to its clients, and an assignment with a Fortune 500 focusing on strategy and governance. His main experiences focused around vulnerability management. Choosing that path might be a bit odd given that Kirschner’s background is in IT, not cybersecurity. He credits Stevens faculty, especially professors Paul Rohmeyer and Michael Parfett, with encouraging him to explore a different field; both faculty have extensive industry and consulting experience within the information systems discipline. After four days of training, Kirschner was immediately assigned to an ongoing project, and saw various contributions to projects show face even before his internship ended. “A lot of it comes from just being confident, and that’s one thing they ingrained very well in training, but also in my Stevens classes,” he said, pointing to a strategy course taught by Dr. Murad Mithani and a systems analysis course with Dr. Chris Asakiewicz. The course with Dr. Asakiewicz colored his business experience with some engineering concepts, which Kirschner said came in handy when one of his managers asked if anyone knew CMMI, or Capability Maturity Model Integration — a process level improvement training and appraisal program that Kirschner did a paper on in class. “A lot of the assignments Dr. Asakiewicz gave us made me think out of the box a little bit, and be creative while still being thorough,” he said. Kirschner is quick to credit his professors and the Stevens Career Center with helping him prepare for his internship, but he also leveraged Stevens’ sizable alumni network in thinking about how his internship might influence his career path, especially when he was choosing among four offers. In fact, Kirschner had seen the network in action up close, already. He previously worked for Realty Operations Group as an IT intern, providing support to a number of departments across the company, a subsidiary of real estate giant LeFrak. After completing his internship, Kirschner was formally extended an offer to return to the company after graduation.